Does your website represent your values and commitment to your business? Nothing elicits trust more than a professional looking website. If your website looks a mess a customer is not going to trust that your online shop is a serious and reputable business. Offer a variety of delivery options and make it clear when a customer should expect to receive their order. Providing delivery tracking numbers is standard practice and is expected as a basic requirement by many online shoppers. Every order that you receive is based on trust. Make your returns policy simple to understand and easy to find. Consider automating the return procedure to make it easy for your customers to return items using their website account. Ensure your business address is on your website. It’s often a good idea to feature it in the footer of your website. A customer is likely to feel more comfortable conducting a transaction with an online shop that also has a physical address listed. Your online shop may only be a part time venture to begin with but it’s imperative that a customer has the ability to contact someone that can answer any questions. Make sure the phone is always answered or a message responded to within the course of the day. A wide range of products not only improves your online search visibility but also projects the image of an established, reputable shop. Include ‘In-Stock’ / ‘Out of Stock’ message on your product pages. If you have the capability you could also show stock quantities. There’s nothing more disappointing than ordering an item and then receiving a call or email telling you it’s out of stock. It should be mentioned than many of the above are required under UK distance selling laws. One of the most important aspects of online commerce is communicating with your customers via email marketing. Although the importance of this is widely understood, finding ways of recruiting quality email addresses can be difficult. Here are our top tips collecting quality email addresses. Ensure you have an email subscription box within the main template of your website. It needs to appear on every page. Provide a first order discount for new email newsletter subscriptions. Make sure customers validate their email address before they receive the offer. Encourage in-store email newsletter signups but ensure your data capture method is sound. Handwriting can be difficult to interpret and transcription from paper to digital can introduce errors. Provide a pre-paid email capture form to your mail order catalogue but don’t forget to to incentivise signups. If you sell in bulk to online retailers ranging your products ensure your products come with a care document/warranty card that directs customers to your personal website. Ensure your email message have a ‘Refer a friend feature’. Introduce an email capture form to your Facebook fan page. Add captioning to your YouTube which direct people to your newsletter signup form. Pin images of your products with offer information that links through to your email newsletter signup page. Partner with companies that offer similar products and share marketing data. Remember to update your marketing policy information on your respective websites. Use services like Google Adwords and Bing Ads to direct customer to your newsletter signup form. Raid your personal inbox and collate email address of friends, family and past associates. Whatever you do… make sure the action is incentivised. The customers willingness to do something for the love of the brand should be a business goal but until such a day you’re going to need to give them something in return. A popular assumption by many is that web designers also double as IT support. This is of great consternation in the industry and the source of many a joke but in the case of Ansell & Clarke it’s true. All our staff have worked at some point as IT technicians. Either repairing Apple Mac computers or heading up IT departments. Often we are called upon to add new services to our portfolio to meet the requirements of our clients who know and trust in us. For this reason we now offer a portable appliance testing service. If you are a business or educational establishment you are required, by law, to conduct electrical tests on equipment such as computers, white goods (e.g. kettles and toasters) and power tools. Using specially calibrated instrumentation we are able to test your portable appliances to ensure you and your staff are operating safe equipment. The results are recorded on paper and provided to you for your records. In addition to this, all tested items will be marked by way of a green or red test sticker (Green = Pass / Red = Fail). We also replace faulty plug tops and fuses if required (free but subject to availability) to ensure no item is out of commission for longer than need be. It’s always a tough task to plan your newsletter campaigns for the year ahead. Trying to blend those important sales messages with fresh and exciting content can certainly cause the brain to work in overdrive. To make things a little easier we have created an Email Newsletter Calendar that outlines important dates for 2012 and which have the potential to be used for promotional activities. We have even thrown in a few ideas that you are free to use. It’s sometimes impossible to have a conversation on a subject without some jargon creeping in. Here is glossary of ecommerce terms you might find handy. An automatic email that is sent to a customer or newsletter subscriber when they perform an action. This could either be a link being clicked or a basket being abandoned. Usually shown as a percentage, bounce rate shows how many people have entered your website and left without visiting any other pages. Examining this figure will give you an idea as to the quality of your website visitors. A high bounce rate will generally mean that your landing page is not providing your visitors with relevant content. A system that allows the website owner with little to no technical expertise to make changes to their website. The user will usually log in to an admin section of the website where they will be able to make text and image changes using a basic word processor interface. A conversion is the completion of a pre-defined goal. It could either be a customer completing a transaction on your e-commerce website or simply filling and submitting your online contact form. It is also possible to combine conversion tracking with ‘funnels’. Goal funnels allow you to track the steps a customer takes before reaching the goal. Simply another name for email newsletters sent out using an email marketing system. A landing page is single web page that is used to provide content that is highly relevant to the advertisement or link that a visitor clicks on. For example, if you sell dresses and have a PPC advert promoting a green spotted dress you would ensure that when a visitor clicked on the link they would arrive at the page with the green spotted dress as opposed to the home page. Constructing well thought out landing pages can lower website bounce rate. These appear on search engine results pages and are generated by the search provider’s own algorithm. Organic listings have the benefit of being free (if you discount the cost of ‘getting to the top’) and are also accepted as a more trusted result by the searcher. Organic results generally have a higher click through rate than paid advertising. Payment gateways provide ecommerce retailers the ability to authorise transactions. They protect customer credit card information by encrypting information as it passes from the customer to the retailer and the retailer to the payment processor. A set of requirements defined by the major debit and credit cards that ensure retailers meet a minimum standard of information security. Compliance checks can be carried out by an external assessor or by self-assessment depending on the volume of transactions. Advertisements that only cost you money when someone clicks on them. Most likely to be seen at the top and right hand side of the Google search engine results pages. These are the results that are displayed when you search for a keyword using a search engine. SSL itself is a technology used to encrypt data as is passes through the internet. It is comprised of two keys which are unique to each other. One key encrypts information while the second key decrypts the information when it arrives at its destination. A third party company provides these keys along with a certificate which proves their authenticity. The certificate can be viewed by customers using your ecommerce shop. Considerations for client and agency when preparing an ecommerce venture. 1) A fully defined feature checklist. Before the design process can begin the client and agency must be clear on the type of features that the ecommerce site will have. Provision can then be made to ensure the designer takes into consideration the placement and design of these elements. Increased website functionality can also create the requirement of additional database information. 2) A database with all the necessary fields in place. Be it a large or small online shop the initial seeding of the database should be done as a bulk import. Using a spread sheet is far easier than keying data directly into the ecommerce platform and allows the customer the time to work on product data, cross sells, up-sells etc. during the websites development phase. One of the most important and often underestimated aspects of selling online is imagery. It is VITAL to have engaging, professional lifestyle photography and also detailed still life product images. After all… a picture tells a thousand words. Next to the development and marketing of the site this will be your greatest expense. 4) A detailed understanding of the existing IT systems and third party suppliers used. Your ecommerce agency must fully understand your current business processes. This is especially important when developing sites for multichannel retailers who will already have POS systems, fulfilment companies and couriers that the ecommerce website will need to integrate with. 5) Merchant provider and payment gateway. If you enjoy filling in forms you will love this part. A merchant provider will likely be the bank who you currently use for your business transactions. The payment gateway company will provide you with the secure link between the website and your bank allowing you to take money and issue refunds. 6) A development plan for the future. Selling online is an art form that can often require numerous iterations of designs and features to maximise conversions. When planning your ecommerce venture consider budgeting for split testing, focus groups and continued website development. Any website is only as good as the traffic it receives. Of course one must consider search engine optimisation and social media but do not ignore the power of print advertising. The use of unique promotional codes will allow you to easily monitor the success of marketing campaigns both off and online. A point that borders into the realms of business consultancy, but one that is worth mentioning. As an e-retailer you should not/cannot expect to run such a business on your own. We have seen first-hand the value of investing in great people and so have our clients. From creating and sending out promotional email newsletters, engaging with your customers through social media to managing an AdWords campaign these all require a significant amount of time. A professional agency will be more than happy to provide these services for you and you will of course benefit from their knowledge and expertise, but do also consider employing someone to manage these aspects of your business for you. It may very well be more cost effective. 5 ROI drivers for your ecommerce shop. – What happens is someone makes a typo? Will they be notified or simple told that nothing was found. – Does the search facility learn from user behaviour and adjust search results accordingly? – Can you filter and refine your search to specific price, brand, size and colour. Cross-selling is the process of linking products together so that they are displayed together. It’s a labour intensive process but it will enhance your customer’s online experience. Up-selling was born in bricks and mortar shops. Just think of the sweeties at the supermarket checkouts or in the case of my local Shell garage the Red Bull they slide across the counter while announcing a special offer. Don’t miss the opportunity to try and entice your customer into purchasing that little extra something. Sometimes people are reluctant to engage in up-selling in the fear that this will distract the customer and cause them to drop out of the checkout process. Executed sensitively you should not encounter this problem. There is no escaping social media and its power to engage wide audiences. If you customers love your brand or your products it’s highly likely they will want to tell people about you. Placing a sharing icon on your product pages is an easy win and allows your brand activists to promote your product or service. Research has shown* that consumers spend at least a day researching a purchase before clicking the buy button. By incorporating product reviews and ratings into your website you become a source of information who people will turn to when making a buying decision. Recruiting genuine reviews is not a great challenge either. Consider using an auto responder to send out and email a few days after the purchase inviting the customer to review the product. Incentivise them by offering a discount off their next order on submission of a review. Online Outlets – A reflection of the economic climate or just good business strategy? For years if you wanted to sell excess or end of line stock online you would reduce the item and place it in a sale category on your website. But, for the past few years there has been an increase in the number of online outlets being setup by companies such net-a-porta, asos, Argos, Tesco and Debenhams. The outlets referred to in this article are not outlets in the truest sense of the word for the retailers are, in most cases, not selling own label products direct from the manufacturer. For the sake of clarity and because I can’t think of a trendy new name for these shops (suggestions welcomed!) right now we shall keep the terminology the same. The main point which provides me with the most interest is that online retailers are willing to create an entirely new sales channel to promote reduced items. The setup of what is essentially a new business (in the case of THE OUTNET) costs money… a lot of money and when you take into account requirements such as branding, website development, changes in warehouse packing routines and upgrades to backend fulfillment systems, it leaves you wondering how much of a mark-up was on the product in the first place to enable the business to maintain its profitability. I have however heard of some companies that are quite prepared to make a loss on outlet items and allow their full priced shop to subsidise the outlet. This, I imagine, is part of their wider business strategy and can be valid in some situations such as improving brand awareness and cash flow. In other cases it’s just the result of bad planning and a desperate attempt to move stock. So, why has the formula for presenting sale stock changed so much? Walk into a high street shop with sale banners in the window and 9 times out of 10 you will be required to walk past full priced items first. Online outlets on the other hand allow the consumers to walk around the full priced items before getting to the sale. In my view this is just indicative of how online selling is adapting to the needs of the increasingly savvy online shopper. The statistic that you have 7 seconds to make an impression on your customer before they leave your website has existed for years but it is still a valid point even more so when consumers looking for a bargain are involved! Personally, I don’t believe that online outlets are a sign of hard economic times. Sure retailers are struggling but the development of online outlets is just a natural evolution of online selling. In an increasing competitive online market place anything a retailer can do to help customers identify a suitable product and provide a quick and direct route to purchase is a positive move. It also serves to inspire loyalty and trust in the retailer. Welcome to a new employee. Today is a very exciting day for we welcome a new employee into the fold. Matt joins us as a developer who will be tasked with bringing our design teams ideas to life. He will also be improving upon existing technologies and developing new functionality that we believe will have a positive effect on our ecommerce clients ROI. Using Facebook to connect with customers. How can I maximise the potential of my Facebook account? The problem I find is that if you do not use social media in your daily life then it is very hard to understand its relevance to business and how it can help you to interact with your customers. I know this because I was once a ‘non-believer’, reluctant and resistance to engage in what I believed to be a fad. In the interests of research I signed up for a Facebook account. It soon became apparent that it offered so much more than idle chit chat. People would share website links and information that would be of interest to me and because the information came from trusted sources such as friends, family or likeminded individuals it carried far more weight than a search engine listing or advert. It’s this form of virtual word of mouth that can provide businesses with a crucial point of entry into the lives of potential customers. How do I get people to ‘like’ my Facebook page? The question is not as difficult as it seems. Think of a friend and now think of the qualities that attract you to them. Taking these on board it’s very easy to see how a business can use these qualities to connect to its customers. 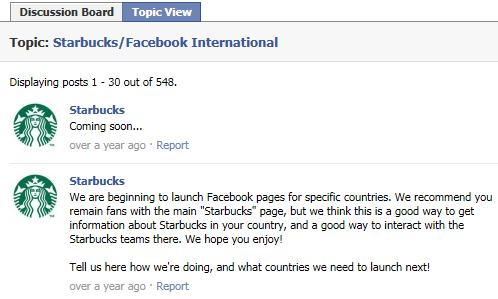 Let us take Starbucks as an example of ‘how to do it right’ and analyse their Facebook profile. Caring – Just take a look at their company overview. In black and white they make their values clear and even transmit their beliefs through their staff. Who better to become a brand activist than your own employees?! Good listener – A quick check of the Starbucks Facebook discussion group makes it clear that they value what their customers have to say. They even give the customer the opportunity to affect the development of the brand and business. Enjoys the same activities – The Facebook Wall Photo section plays the part of humanising the brand by placing the product and the brand in real life situations with real people. Interested in your opinions – What better way to help you develop your product range than to ask your customer what they prefer. The ‘Polls’ functionality of Facebook fulfils this requirement. Makes you feel good about yourself – This is really a result of branding but Facebook does serve the role of positive reinforcement. Being around like minded people only serves to further the devotion to a brand. Here’s an interesting article on how brands can trigger the same feelings as a religious experience. So as you can see, being a business that is ‘liked’ by its customers is as simple as being a good friend. Connect with your customers on a personal level and trust that they will reward you with their continued loyalty.